How Long Can Scabies Eggs Live? If you've been infested with scabies, also known as the "human itch mite," you may not know it for some time. According to the Centers for Disease Control, while scabies is more common in conditions where people live close together, such as jails and extended-care facilities, the mite doesn't discriminate based on race, class, gender or hygiene. Being alert to the first signs of scabies allows you to cure this itchy skin condition before you pass the mites on to others. The average scabies mite has a lifespan of one to two months and has four life stages: egg, larva, nymph and adult. All it takes is one impregnated female scabies mite to result in a human infestation. The female mite burrows under the skin, where she deposits two to three eggs every day. After the eggs hatch, larvae emerge and make their way to the surface of the skin for another three to four days. After the larvae molt, they turn into nymphs; after another molting process, the adult female scabies are ready to breed with smaller male mites that linger in small pits in the skin. The newly-pregnant female mite creates a new burrow, and the life cycle begins all over again. Scabies are microscopic and cannot be visualized on your skin. Female mites are are 0.30 to 0.45 millimeter in length and 0.25 to 0.35 millimeter in width. Males are roughly half the size of their female counterparts. There is a lag time between the time a human infestation occurs and when signs such as noticeable burrows, rash and symptoms of intense itching begin--typically between two and six weeks, according to the CDC. During this time, someone infested with scabies can still pass the mites onto others through close, skin-to-skin contact. Adults typically acquire scabies through sexual contact with an infested partner. If you have scabies, the first sign you may notice is itching that is more intense at night than during the day. Itching gives rise to a red, pimply rash. You may also note the presence of scabies burrows in specific parts of your body. In adults, scabies prefer areas of skin that fold or touch each other, so you may note small, slightly raised serpentine ridges in the webbing between your fingers, inside your wrists or elbows, under your breasts or genital area, or between the shoulder blades. In children, scabies prefer to take up residence in the neck, scalp, soles and palms. Treating scabies requires a visit to the doctor to first identify the infestation. 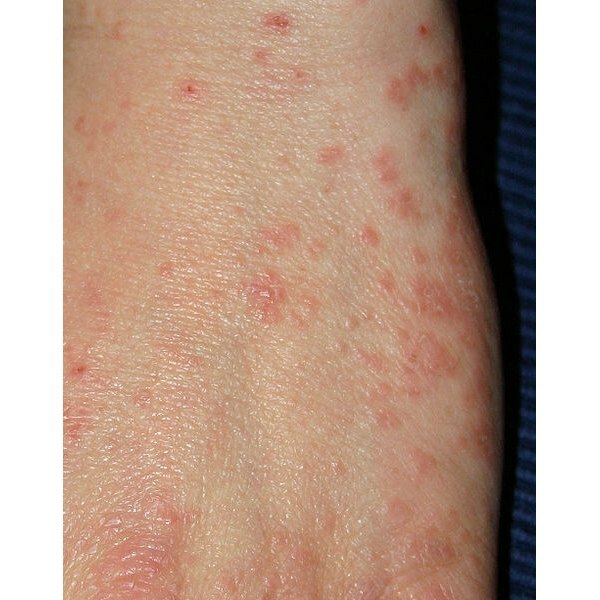 While an experienced dermatologist can often diagnose scabies by noting the presence of burrows, skin culture tests can confirm a scabies infestation. Treating scabies requires purchase of a prescription topical medication that contains either permethrin or crotamiton. These topical applications are applied all over the body from the neck down and left on for a certain number of hours and then thoroughly washed off. Although this kills the mites and their eggs, many people still experience itching as the remnants of the mites and their feces continue to cause an allergic reaction in the skin for a week or sometimes longer. Scabies mites cannot live very long without the blood of a human host--usually no more than 72 hours (three days). An important part of eradicating scabies and preventing a reinfestation is ensuring that all clothing, linens, towels and other personal items are thoroughly washed in hot water and dried on high heat. Things that cannot be laundered can be stored in containers or garbage bags and placed outside of the home for three days until the mites die of starvation. Can You Get Scabies From Playing in the Dirt? How Do People Get Pin Worms?